Following a competition win in 2014, 5plus Architects have submitted a scheme for Salford Crescent to planning. The site is located to the eastern edge of the City of Salford within the context of emerging neighbouring frameworks at Middlewood Locks, Outwood Wharf, Chapel Street regeneration area and the Adelphi Riverside. 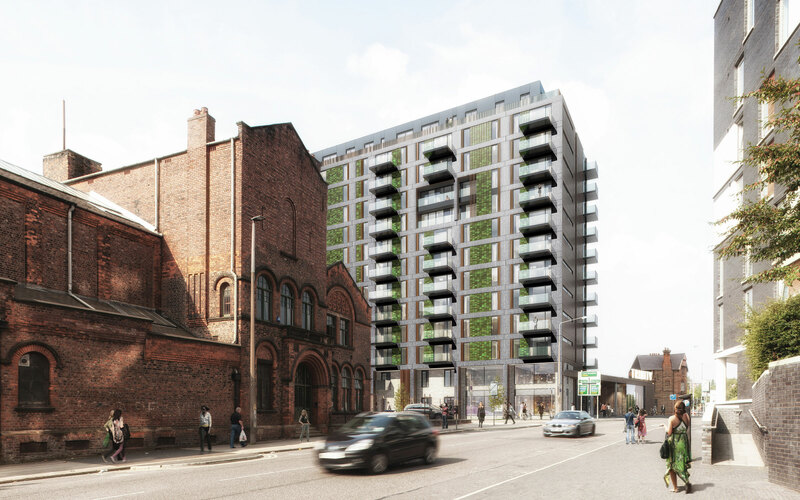 The development includes a 22 and 16 storey tower to mark a gateway between Salford and Manchester. They celebrate the start of the Middlewood Loop, the green route from Manchester to Salford Meadows and the University of Salford campus. The towers maximise views of The Meadows and Manchester City Centre and they are positioned to work as a cluster of taller elements when read against neighbouring proposed tall building at Outwood Wharf whilst stepping down to relate to the neighbouring lower rise buildings. Terraces reinforce the street scene and reflect the significant grade II listed Crescent terraces adjacent. A new green courtyard provides amenity for residents and public whilst augmenting the green route between Middlewood and Salford Meadows. Hulme Street is re-imagined and reclaimed as a new residential street with lower proportions which are lined with town houses. Internally, residential amenity spaces create a social hub to encourage the development of a sustainable community where residents stay for longer periods. Amenity includes a well equipped gym, on site 24 hour concierge, function rooms and entertainment / cinema rooms.